The Berkshire Park neighbourhood is a unique Winnipeg case: an entire suburb designed by a single architect and built by the same firm. Dating to the years 1963-67, the area was developed by Haag Homes Limited. Haag had an extensive background with construction in the city’s south end, having built – among other developments – at least 200 homes in the Riverview neighbourhood. For Berkshire Park the company made a bold move: hiring noted Manitoba architect Étienne Gaboury to plan every home in a district spanning over six streets. Period advertisements for the neighbourhood prominently touted Gaboury’s name. This effort makes clear that a certain cachet was attached to his involvement, the developer clearly hoping to profit from the architect’s notoriety. These ads promoted, as well as, the area’s homes’ spacious bedrooms, large kitchens, Walter Wray windows and oak parquet flooring. Town homes in the area first were sold at a price of $12,350; the community’s original display home was located at 15 Berkshire Bay. The advertising of Gaboury’s name indicates that the architect had a level of fame, at least locally – enough to warrant the promotion of his name as a key attribute in marketing a residential development. This was, in fact, the only circumstance of such advertising in Winnipeg during this period – and possibly one of the only instances of such an approach in the country. The linking of Haag and Gaboury in this way was undoubtedly spurred by the fact that both were key figures in the construction industry in the south-east section of the city over the prior decade. Berkshire Park was developed in what was then the City of St. Boniface; the City of Winnipeg’s 1973 District Plan for St. Boniface lists the neighbourhood within the Windsor Park Local Planning Area, forming its north-most section. The development was part of a large boom in population in St. Boniface during the post-war era. The municipality increased its number of inhabitants from 26,342 to 37,600 between 1951-1960, reaching 43,214 by 1966 and 45,370 by 1969. This growth rate significantly exceeded that of Metropolitan Winnipeg as a whole. A 1958 graduate of the University of Manitoba’s School of Architecture, Gaboury conducted post-graduate training at the École des Beaux-Arts in Paris, during which time he was effected by the experience of the work of the famed early modernist Swiss-French architect Le Corbusier. Given this, it’s not surprising that Berkshire Park bears a resemblance to Le Corbusier’s renowned 1920s neighbourhood design at Quartier Modernes Fruges, in Pessac, France. As at Pessac, at Berkshire Park a set of different building-plans alternate throughout the neighbourhood, creating a sense of both coherence and variety. While at Pessac one finds a mix of detached, semi-detached and row houses and three-story apartments, at Berkshire Park the homes are all duplexes, each with their own gardens – a fusion of privateness and sociability. In both cases, time has brought personalization to a once standardized plan, with a variety of colours of paint replacing the original white. If in the modern era architects and critics have at times regretted the demise of the architectural harmony, here – spurred by circumstance and economics – Gaboury brings back such balance while accommodating a contrasting desire for variation and individuality. Gaboury spent much of his career building in nearby neighbourhoods – his office was located in St. Boniface for many years. In a number of his most celebrated works the architect selected stone and wood as his materials, as at St. Boniface Police Station, County Court and Health Unit and Église Précieux-Sang. 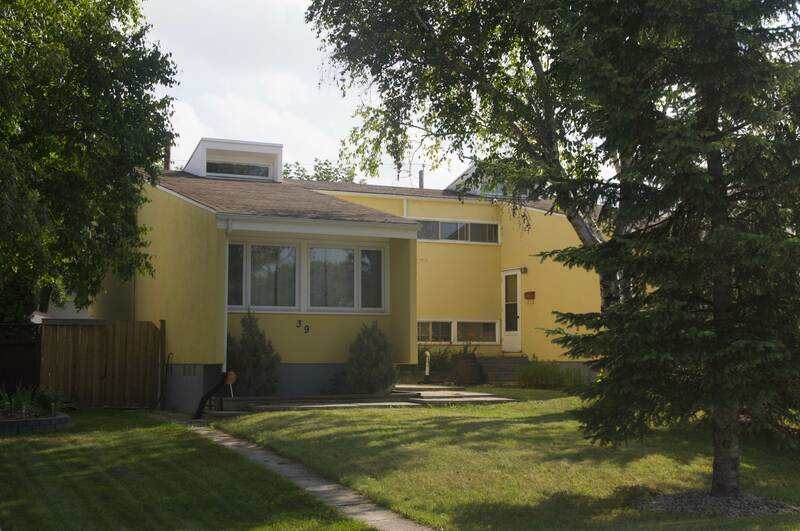 At Berkshire Park, however, he employed largely stucco: a dominant material in Canadian suburban construction. 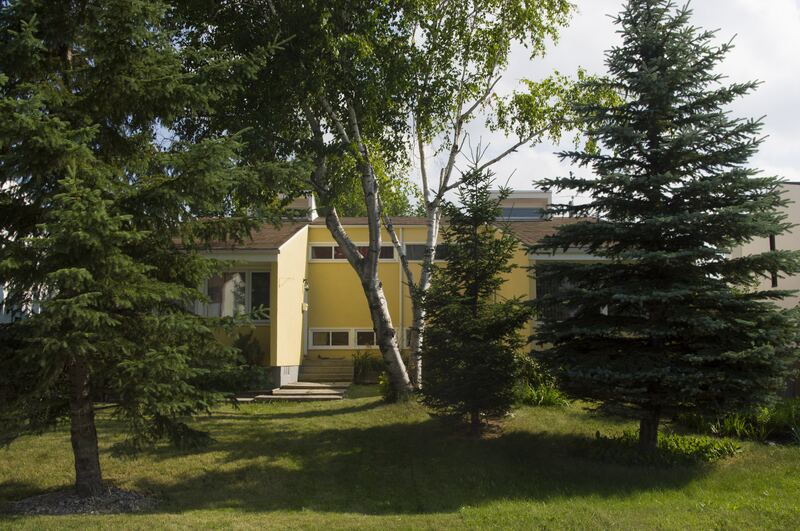 As is apparent in his other stucco projects, at Berkshire Park Gaboury made the material his own through the employment of a sculptural treatment of form. This approach is manifested in the deployment of large areas of stucco left deliberately unadorned, the use of overhangs and fin-walls, inset doors and windows, exaggerated pitched rooflines, unique window shapes and the use of decorative siding. Through some of these techniques Gaboury engaged with the prairie light, a subject that formed a continued motif throughout his career. Beyond Le Corbusier some of these gestures – in particular the use of expanses of white – here recall the work of Finnish architect Alvar Aalto. This home follows the general pattern of Berkshire Park in its duplex form. As throughout the neighbourhood, here the duplex utilizes one of a limited number of designs, alternated to provide aesthetic variety. In this case the architect, Étienne Gaboury, differed from his general use of two-storey rectangular plan topped by a gable roof. Instead, the shape of the split-level home – twinned with its neighbour – created a C-shaped plan with a protected forecourt at centre. Dramatically, a gable-roof is exaggerated as it covers a forward-thrusting wing that approaches the street and sidewalk. The façade of this section is fronted by large picture windows. Atop, this wing is capped by angular clerestory gables which provide interior illumination and aesthetic interest. Large areas of sparsely-embellished stucco are left bare, a simplicity that also speaks to the architect’s modernist inclinations. Similar homes in the area can be found at the adjacent 41 Berkshire Bay, 3 & 5 Berkshire Bay and 685 & 687 Elizabeth Road. The same plan appears in mirror-image (with the deep wings located at centre) at 27 & 29 and 63 & 65 Berkshire Bay.